Faith in Jesus made the leap from the lands Paul and John had evangelized to a brand-new regions: a land of pagan Celtic tribes that had finally bowed the knee to the Roman Empire (pg. 71). But we see that not only did a simple faith in Jesus make the leap from Asia, but also discipleship – Christians who were training for the heavenly contest – disciples who were fully prepared to give their lives for Jesus Christ. Yet there were some, who in the words of Eusebius were “untrained and feeble” and who ended up shamefully denying Christ (Early Christian Martyrs Stories, pg. 72). I half-expected that this would be the end of the story concerning the “untrained and feeble,” and that Eusebius would only focus on the heroic and victorious martyrs. And while most of the account of the persecutions at Lyons and Vienne did focus on those martyrs who were trained and faithful, he devoted a few paragraphs to those who denied the Lord. He starts off by noting how terrible it was for those who denied Christ. He said that they were “dejected, ugly and full of disgrace. Moreover, they were ridiculed by the pagans as despicable cowards (pg79).” But what amazed me was not the shame that these people endured, but what happened next. The deniers had been sent back to prison, but in God’s amazing plan they had not simply returned to rot in prison awaiting death. Rather, God sent the faithful ones to intermingle with them in prison and restore them. And yet, God didn’t allow their story to end at that point. Some of them were ready to die for the Lord and others were not. But even the ones who denied Christ were still shown incredible grace and mercy from the Lord. Pastor Foley has pointed out that martyrdom is repetition of the story of Christ’s suffering and death. But in the case of these French Christians, we not only see faithful Christians re-enacting the suffering and death of Christ, but also re-enacting the forgiveness and restoration of Peter as seen in John 21. These Christians, who were nearing the point of death themselves, were still training failed Christians for martyrdom and assuring them of Christ’s forgiveness that was still available to them in their time of need. 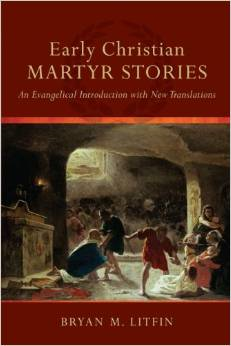 This entry was posted in persecution and tagged Early Christian Martyr Stories, Eusebius, french persecution, martyrdom. Bookmark the permalink. This is a powerful reminder that each of us receives second chances every day until the end. Thank you for sharing…I’d like to read this book now. Thanks for the comment Linda! I hope you and Kent are well. This is encouraging and gives hope to us all. Thank you for sharing this.